Happy (almost) Valentine’s Day everyone! We had yet to do a true Valentine’s Day comic, so I’m glad we actually remembered this year! Valentine’s Day is actually the 2-year anniversary of 2P START!, so there will be a special little bonus comic to mark the occasion on Saturday. Also, if you like one of these V-Day cards and would like to send one to a friend, you can do that from this blog post. I guess these aren’t exactly the most loving cards you could send, but they should make people laugh, and if you can’t make someone laugh, they’ll never love you. Therefore, these ARE the most loving cards you could send! HAHAHAHAHA. Download please! Great work! It’s been about 5 years since i last saw that stupid dog… I still want to shoot him! So Bad! bahahahah! that made my day! good job guys ecg! 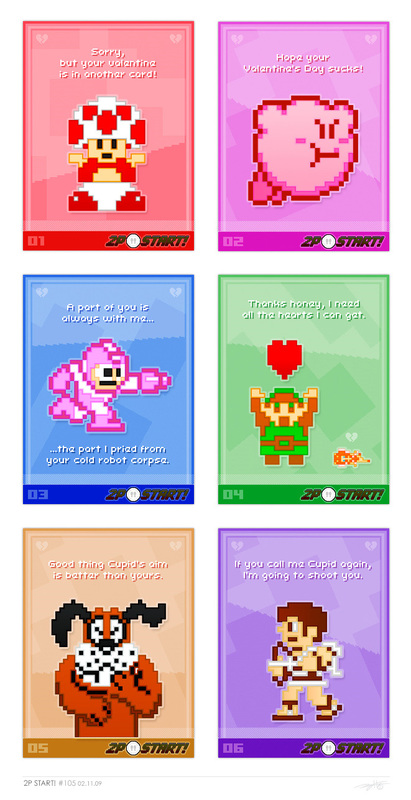 These are some of the best gaming valentine cards I ever saw, these are awesome. I love the little dead heartbroken fairy included in the Zelda one. and a extra comic this week?!?! How can this week be any better? Hm, not as good as the usual comics, but still funny. I especially liked Toad’s card. If your logic is correct, Tim, then I’m going to give the Kirby one to that girl in my class that I have a crush on! I like the dog from Duck Hunt…. I really like 1, 4, and 6. This comic is amazing! I’m sending these to all my single friends! Wallpaper please! My favorite is the Mega Man one. Just finished posting, and saw the NES part of Valentines. That’s so funny. NCG! I would like to second Noodle’s opinion. Downloads? What have you done? Hundreds of 2pstart fans will be sending these out to people who have no idea what they mean. I’m afraid there will be many lonely 2pstarters this valentines… but maybe that’s your evil plan? Make sure they have nothing better to do than devotedly follow your comic? You realize he’d shoot you for saying that, right? I love how the last two cards interact with each other, while still being sully understandable by themselves! PS. What ever happened to the editing feature, Tim? It just vanished one day…..
that was quick! gonintendo has link to 2pstart for the valentines cards! thats awesome. Nice! I like the Duck Hunt dog and Zelda ones especially. The Toad one is good too. Can’t wait to see the bonus comic! I know what I’m giving out this year!!! I made a gaming valentine of my own this year. It’s an upside down crab with an arrow in it. I’m a long time reader of your comics and a long time listener of your podcasts, but i’m just now choosing to ‘rise from my grave’. All your comics have been awesome, and its pretty cool to have these cards for valentines day, i’ll be printing my girlfriend out the toad one, as im pretty sure its the only one she’ll recognize the character on. These remind me of Woot’s bitter valentines! Also, look at their sweet ones. Welcome to the site! Hope you stay with us and enjoy the community! I emailed Tim about it. He said they were running into some issues and it is turned off until further notice. I love it. These are absolutely classic. I hate Valentines day, and to me. These cards are the best there is. Both of you did such a great job on this one. Keep up the great work. The only bit of a bug I got is that I wish there may have been a few more, but otherwise they are pure gold. In my opinion this was pretty lame. I get the jokes but they are just not funny. Hope you guys do better next week. Also my cult is coming along nicely. You’d have to be living under a rock to not get these. I belive I asked that question a few comic ago. It’s just not working. It was removed as a remedy to the 500 internal server error (one of which I got this morning at 6am) and I guess for the most part it worked, so it’s been permanently removed. Oh, wait. I take that back. I misread the comment. I thought you were saying that too many of the 2P START! readers were too young to get them. My bad. Ha! i just noticed the title. This comic just got even better. Hi Ray and Tim! I guess I’m “rising from the grave”… First time poster, but I’ve been reading 2P Start since the Koopa/ Goomba pokemon comics. I just got into the podcasts about two weeks ago and I’ve listened to them twice through at work. I’ve even convinced my brothers (staunch Sonic fans, I might add; they thought even Shadow was a “pretty okay game”) about the wonderfulness that is 2P Start comics, the hilarious, well-written and edited podcasts (Black Doom awards are now the highlight of my week :D), and even the informative and entertaining extras. Keep up the great work guys! Ooh Ooh, more valentine’s day card ideas! Final Fantasy (7)- Is that your buster sword, or are you just happy to see me? Did I mention I started reading at about then, too? I finally found you, FAKER! Valentine’s Day is actually the 2-year anniversary of 2P START!, so there will be a special little bonus comic to mark the occasion on Saturday. Check the blog post. It’s the most recent one. I don’t actually read the blog, so I didn’t see it. Greetings guys. This is my first time chiming in, and allow me to say that in the few short months since I found your comics, I have been thoroughly entertained. Awesome stuff. Anyways, one last bit, and kind of a flash back. I’ve bene tracking my way through your podcasts (also great stuff), and just today I heard something rather eerie. In episode 38:Mega Edition, Tim’s trivia question dealt with the leader figures form the civilization series. Then there were jokes made about updating the game, and replace Lincoln with Obama, who had not yet become president. Apparently, Tim has the gift of an oracle. Now if he’d only ramble of thesome lotto numbers. I agree. Tim, lottery time, yea? I would really give these if i knew people with this kind of humor.